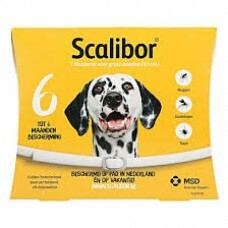 Scalibor protector collar prevents ticks, sand flies and mosquitoes from biting dogs for 5 to 6 months. Stops your dog from acquiring diseases such as Leishmaniasis, Lymes disease (Borreliosis) , Ehrlichiosis, Babesiosis and heartworm disease. Controls infestations with ticks (Ixodes ricinus, Rhipicephalus sanguineus) for 5 to 6 months. 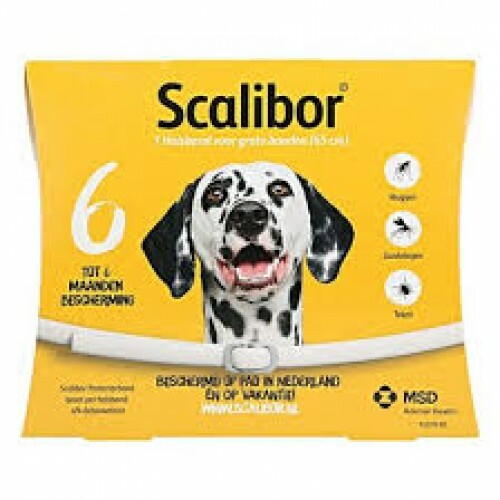 Do not use on dogs known to be hypersensitive to pyrethroids. As the collar exerts its full effect after one week, the collar should be applied 1 week before animals are likely to become exposed to infestation. In rare cases attachment of ticks can occur while wearing the collar. Under unfavourable conditions the transmission of infectious diseases through ticks or sand flies can therefore not be ruled out entirely. In rare cases localised skin lesions, localised dermatitis or erythema, pruritus and hair loss can be observed. In case of skin lesions remove the collar until symptoms have resolved. In extremely rare cases neurological signs such as tremor and lethargy have been reported. If this occurs, the collar should be removed. These symptoms usually subside within 48 hours. Treatment should be symptomatic, as no specific antidote is known. In the unlikely event of the dog eating the collar the following symptoms may occur: uncoordinated movements, tremor, drooling of saliva, vomiting, rigidity of the hindquarters. Diazepam can be used for symptomatic treatment if necessary. Do not use with other ectoparasiticides containing organophosphates. Do not use this product if you are allergic to triphenyl phosphate. Avoid letting children, in particular those under 2 years old, touch the collar, play with it or put it into their mouth. Care should be taken not to allow young children to have prolonged intensive contact, e.g. sleeping with a pet wearing a collar. The collar, sealed inside the foil sachet, should be stored in the outer carton. Do not store above 25°C. Deltamethrin is harmful to fish, other aquatic organisms and bees. The 48 cm collar is to be used on small and medium-sized dogs. The 65 cm collar is to be used on large dogs. For fastening around the neck. One collar per dog. For external use only. Remove the collar from the sealed protective sachet. Adjust the collar around the animal’s neck without tightening it too tight. Two fingers side-by side should fit between the band and the dog’s neck. Slide the end through the buckle and cut off any excess length extending beyond 5 cm.